In Manhattan, Max (voice of Louis C.K.) is enjoying his life as his owner Katie's (voice of Ellie Kemper) best pal in the comfortable apartment building where they live together. He loves her so much that he sits by the door, just waiting for her to come home each day. But one day, his life is turned upside down when his human brings home a sloppy mongrel named Duke (voice of Eric Stonestreet). Duke turns out to be less than careful about Katie's decor, which gives Max an idea. He decides to break some things and blame it all on the new guy. 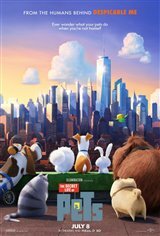 But when Max and Duke get away from their dog walker and are captured by Animal Control, they run into a bad little bunny named Snowball (voice of Kevin Hart) and his gang of unwanted pets, while Max's friends, especially Gidget (voice of Jenny Slate), who has a crush on him, hit the streets in an effort to rescue them.